For as long as she could remember, 26-year-old grad student Cole Cohen struggled with learning disabilities that made it nearly impossible to judge time and space-standing at a crosswalk, she couldn't tell you if an oncoming car would arrive in ten seconds or 30; if you asked her to let you know when ten minutes had passed, she might notify you in a minute or an hour. Doctors found a large hole in her brain. 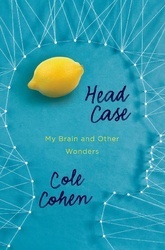 Because there aren't established tools to rely on in the wake of this unprecedented and shocking diagnosis, Cole and her doctors and family create them, discovering how to navigate Cole's unique world. This passionate, lovable, and unsinkable young woman charts her path in this memoir filled with charm and wit.